I graduated back in December with my undergrad. The last several months of school were extremely stressful, as were the conditions at my job. I hardly ever read anything that wasn’t school or work related. I couldn’t sit down and read because I knew I had other stuff that needed to get done. It took me more than two weeks to break out of that mindset. Things had calmed down at work, and I had officially graduated. I had so much free time, I honestly didn’t know what to do with myself. I was almost more stressed now, because I didn’t have all that work anymore. I kept thinking there was something I needed to do… but there wasn’t. I was finally allowed to have some time to myself. It didn’t sink it. Apparently what I needed was a couple of weeks to adjust… and an amazing book. 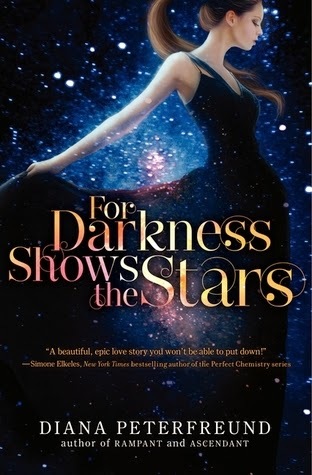 For Darkness Shows the Stars was that book for me. I was completely sucked into the story. I had read one or two books since graduation, and I’d come across some very weak main characters. I was frustrated by their lack of backbone or determination. It’s one of the many reasons I was so instantly in love with this book. “It's been several generations since a genetic experiment gone wrong caused the Reduction, decimating humanity and giving rise to a Luddite nobility who outlawed most technology. Elliot is a fantastic character. She is strong, stubborn, loving, compassionate. Forgiving, sometimes to a fault… However, she doesn’t let those who try to oppose her, or change her, sway her in the least. She knows what is right, and is not about to let anyone dissuade her of that. However, even then she doesn’t let that determination blind her to things she needs to know. Which I realize makes her sound a bit contradictory… In reality, she is an extremely well written character. The world building is fantastic, at first I was a little confused at some of the references, but the author doesn’t let the reader stay like that for long. She creates a society that is rich with details. History, class systems, established rules. The more I learned the more I was drawn into the story. I could not put this book down. I finished it within a couple of days, faster than I’d finished any book in months. I would highly recommend this book. Especially to those looking for a strong MC, lovers of retellings, and anyone who enjoys a story set in a dystopian society. Also… The sequel is even better! Has anyone else read this?? Anyone else experience a post graduation slump like me? Please share! I am with you on the post graduation slump - I graduated last May with my B.A. & that slump is finally hitting me. This is a great book to help :) I loved it so much! I haven't read the sequel yet, but your review reminded me to put it on my TBR! Oh I am so glad you like this book! I am been considering it for so long but I was wondering if it was worth the purchase. Added it to my basket now :). Great review! I hope this means the end of your slump. I've heard nothing but good things about this particular book from other blogs. I'm glad your positive experience with this book pulled you out of your reading slump. I tried reading this book, but was a bit confused by the first two chapters. Probably because I was trying to remember what happened in Persuasion, and find which parts of FDStS fit into the mold! I really want to read the sequel though, so I think I'll try reading this one again soon. Congrats on graduating - hope you find some more amazing books! I loved this book and like you, I loved the sequel even more!